The use of barriers Contflexdique in civil engineering. Examples of use of Contflexdique barriers in civil engineering. Construction of small dams provisional or fixed. Formation of the terraced plots. Regulation of river ravines by crash barriers and barriers. Antitormentas desert sand walls in railways. Stuffed middle ground by lateral lines contflex. Temporary water retention and channeling interim. Formation of road medians and side protection (curves, ravines, slopes, etc.). Protection of anti snow avalanches (even filling it with snow). Formation of the peripheral walls of the pond deposits. 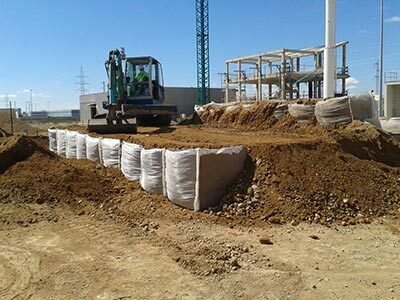 Retaining walls in lateral excavations, freeing the sides of the excavation wall or interior wall that is visible.